Outboard fun doesn’t get much better and affordable than the Bayliner 170 Outboard family thrillseeker. American giant Bayliner Boats just keeps on floating exciting sportsboats, this time with the very impressive 170 Outboard bowrider. Bayliner makes the highest selling boat in this class in the world, the always impressive Bayliner 175 BR with the 3lt MerCruiser sterndrive. 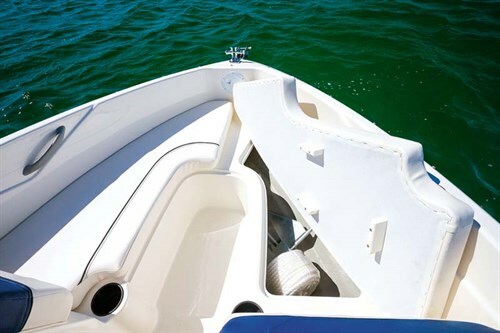 While sterndrive boats have an enormous place in the market, and certainly have some advantages, our local boating market has always had a love affair with outboard motors. Current offerings and advances in outboard technology have made them even more attractive. 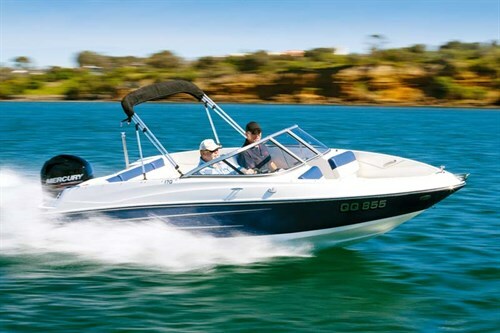 The Bayliner 170 Outboard is an ideal family bowrider at a very realistic and attractive price. She is beautifully trimmed, jam-packed full of features, has plenty of storage, great looks and with the performance to rock your socks off! I came to this conclusions when long-time experienced boatman Michael Galouzis and I took the beautiful bowrider for a hoot and a holler on Victoria’s Port Phillip Bay on a slightly choppy spring. I really like the sporty feel of a boat that you sit down into. The floor is set low enough to improve the volume in the boat, at the same time adding to the stability. She sits you down low and well protected at the helm. We looked directly through the moulded safety glass windscreen at all speeds, not over it as in many competitors. 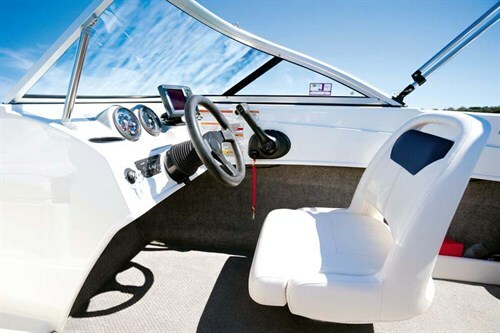 The driver and passenger seats on the Bayliner 170 Outboard swivel. 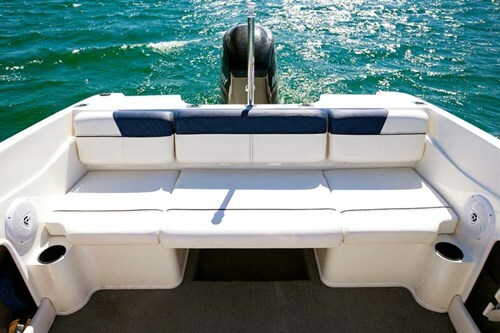 In fact, all of the seating is beautifully presented in two-tone upholstery, and with an air of minimalistic style that Bayliner does so well. The driver’s seat could perhaps do with a bolster to keep with current trends, yet I never found visibility through bow rise a problem, as the package just jumps on the plane and sits with a straight attitude at low speeds. The dashboards keep with the theme of simplistic style that never goes out of fashion. The driver has a pair of bezel-rimmed analogue gauges for speed and tacho, one with fuel and voltage inserts. They provide an attractive accent to the moulded dash but I’ve got to ask the question, where’s the trim gauge? This is one of many boats I have tested lately without one and while it’s certainly not a necessity, I do miss it! That said, it is easy to get the feel for the pleasing amount of available trim range. The flush-mount engine controls are at a comfortable height and the waterproof accessory switches easy to see and access. This boat had a Lowrance Elite-5 HDI colour depthsounder-GPS fitted; a nice local touch and more than suited to the functional package. A handy drinkholder and adjustable sports steering wheel finish off the stylish helm. The passenger console is yet again simple but nice and the Yanks certainly know where to put their drinkholders and security handles! The dash itself has a horizontal glove box with a DNA sound system enclosed out of harm’s way. There is a music remote on the moulded vertical face, as well as an auxiliary/USB port and 12V socket. From the bow back, we find in this case a dealer-fitted split bollard and roller, however the anchor, rope and chain must be carried in one of the dual compartments under the bowrider seats. The actual bowrider area is simple, neat and comfortable, and provides plenty of fun when hooting around the bay for thrills. It’s also a lovely area for the ladies to sit back and tan with a good book and perhaps a nice sauv blanc. There is a clean moulded fibreglass finish in the bowrider section, which is practical and easy to clean should muddy feet scramble over the bow in a riverside situation. As we head back into the large and deep-sided cockpit, the carpet begins. The centre walkway is just the right size and the split windscreen opens to a rubber stopper eliminating vibration and damage. Under the cockpit floor is a quite large storage section that is big enough for most of the accessories we carry in a sportsboat, such as assorted ski jackets, ropes etc. It can also serve as a killtank for fishos. There are short sidepockets down both sides and some fishing rod storage on the portside internal wall. The transom and rear lounge blends with the demeanor proudly displayed by the rest of the 170 OB package. The full-width rear lounge has a moulded storage compartment under the starboard side and by simply lifting off the portside padded cushion you find a non-skid step that runs in line with the rear platform, telescopic ladder and two-tiered step enabling easy boarding and departure for watersports. The starboard side also has a boarding platform where a fisho might mount a berley bucket, but more likely will be used to assist the thrill seekers in the water out the back. The middle section of the rear lounge is left open underneath providing a good area to throw in a wetsuit or towel between dunks – I notice Bayliner offers an option of an aerated livebait tank in this area. I reckon it’s not a bad spot for a small icebox either! Our demo boat had an optional skipole as well as four stainless steel rodholders across the top of the transom coaming. There’s a refreshment holder, grab handle and waterproof speaker on each side too. The plumbing from steering and engine controls is neat and tidy and the through-wall fitting is above transom height further adding to safety. While the non-feedback cable steering felt quite fine, those that know me and those that enjoy their driving should opt up to hydraulic steering for even greater pleasure. However, if budget is a problem, feel secure in the knowledge that the standard fit-up works just fine. 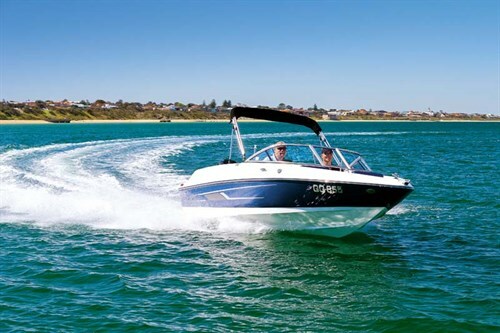 The Bayliner 170 Outboard is an absolute pleasure to drive, riding comfortably over the small chop at high speeds and whipping and turning in a playful and nimble attitude when you unleash her bonds. She’s quiet by design, aided by the foam-filled hull, hangs on beautifully in turns and has a smooth, even wake when trimmed at speed. We slowed her down and trimmed her up to produce a larger wake for a bit of surfing, and without ballast or rear weighting it still produced a reasonable wave. 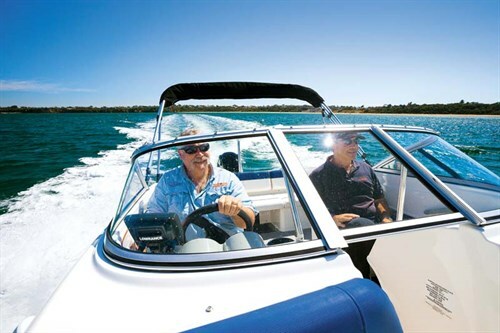 Our review boat was fitted with the now superseded 115hp Mercury four-stroke outboard motor which has been replaced by the much heralded new Mercury 2.1lt inline four-cylinder motor with the option of Command Thrust drive. The performance was exhilarating to say the least. When we smacked down the throttles from a standing start, the Bayliner 170 Outboard was well up and planing in less than three seconds with two on board, so there’s plenty of thrust for social skiing, and that was with a 19in alloy prop. I’d suggest that the new model 2.1lt engine may do even better. Part of the manufacturing giant Brunswick Corporation that also owns Mercury, Bayliner boats hasn’t risen to the top of the world-wide boating field just by chance. It has arrived at its destination by knowing the market and providing attractive, quality packaging at more than reasonable pricing. This is well proved by the fact that for the past six years Bayliner has received the coveted Marine Industry Customer Satisfaction Index (CSI) Award from America’s National Marine Manufacturers Association. The USA is a huge market with plenty of competition and this fact alone speaks volumes. See the full version of this review in Trade-A-Boat #250, February / March 2015. Why not subscribe today?